I started my hexie quilt as a way to try to ignore my sudden desire for a really expensive sewing machine. Well, that mostly worked. I still bought a new machine. This time though, the "new" just applied to me, not the machine. I got an Elna 7000 (the first computerized machine they ever made) from Craigslist. After a service it's been sewing pretty well. I got adventurous and threw my hopping foot on there. 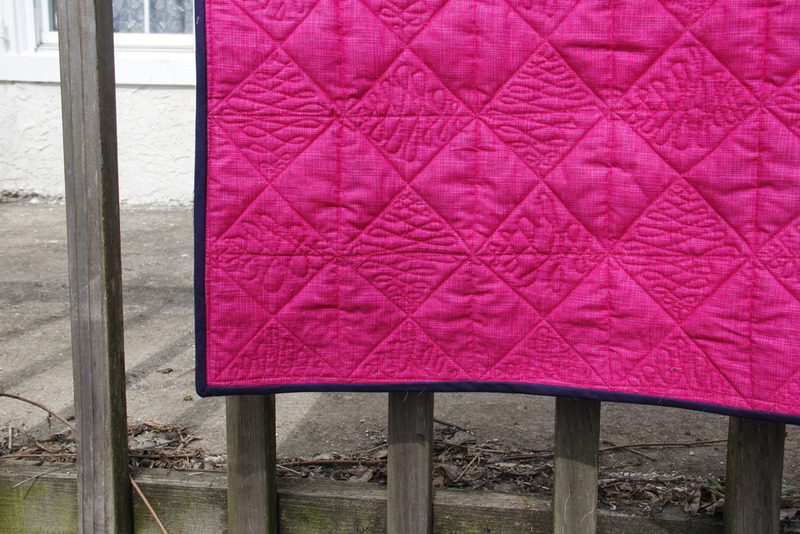 I had some fabric I got on clearance from Gaffney, a pre-pieced fabric that I used for the top and a great hot pink for the backing. I ditched it all and then sewed diagonally through all the blocks. After that I did some free motion and did a wishbone stitch (alternating vertical and horizontal) in each diamond created by the diagonal quilting. I machine bound it in a soft navy solid to coordinate with the plaid blocks. 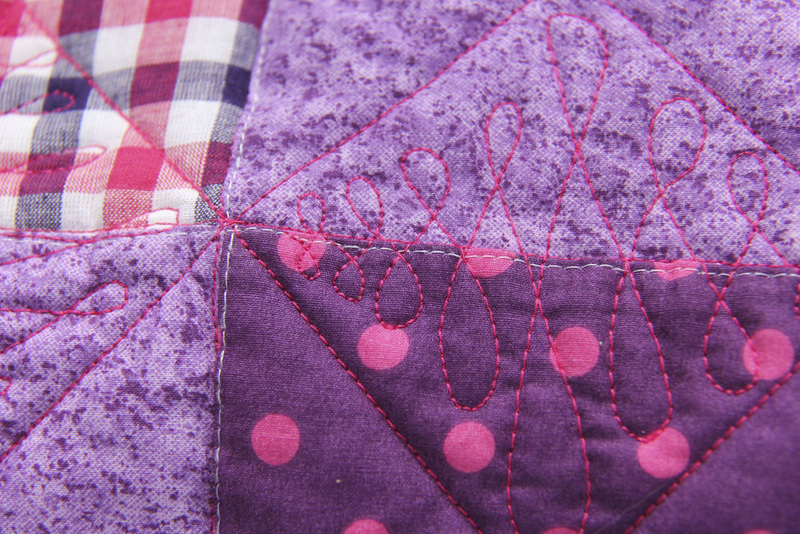 You can see the quilting a bit better on the back. I really liked the wishbone. Not too hard so that I couldn't do it and not so easy that I got bored. I highly recommend this or a similar stitch as a first free motion foray rather than the stipple. Having something where you are supposed to cross lines makes it so so so much easier and takes a lot of the pressure off. I never quilted myself into a corner. I used a cute little loop for the top and bottom edge triangles. All in all, I'm really pleased with how it came out. This is my first quilt using free motion and I'm proud of my efforts. It's a great size for Laser Face (we've called her that since she was in utero!) and is currently folded up under her crib waiting to be used. There is hardly a better feeling than knowing I get to wrap the ones I love in the physical manifestation of my love.